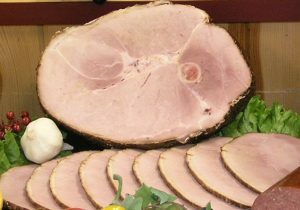 Our Whole, Bone-In, Hickory Smoked Hams are a holiday best seller. The flavor is phenomenal and once you've tried it, you will be a repeat customer. This guide does not necessarily determine doneness. The best test is the temperature of the meat. Insert a meat thermometer in the center of the meat without touching the bone. Make sure the ham reaches 160 degrees. Let the ham rest for around 10 minutes before carving to allow the juices to soak in and settle. What size do I get? We figure around 1/2-3/4 pound per person to ensure you don't run out and possibly have left overs for delicious sandwiches. Make biscuits and gravy according to package directions. Add sausage to gravy at the end. Serve up the deliciousness! Cut off the tops and take out center and seeds of 4-6 Bell Peppers. Fry up 1# of our bulk Mild Sausage and then mix with 8 oz cream cheese and 1 cup (more or less to your liking) of shredded cheese (we love NY Sharp). Fill Peppers with sausage mixture, top with bacon bits if you want.